Sixth sense? Of course, say dogs! Science is catching up with dogs! Those of you who have come across Rupert Sheldrake and, in particular his book Dogs That Know When Their Owners Are Coming Home will really not be surprised at what is coming, in terms of the rest of this Post. 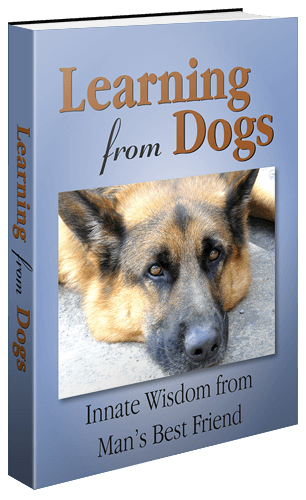 Because most dog owners know, from countless observations, that dogs have an uncanny ability to see the world around them in a more deeper and intuitive manner than we can explain. On April 27th, Mason was hiding in his garage in North Smithfield when the storm picked him up and blew him away. His owners couldn’t find him and had about given up when they came back Monday to sift through the debris, and found Mason waiting for them on the porch. Sight, hearing, smell, taste and touch are the tools most of us depend on to perceive the world. But some people say they also can perceive things that are outside the range of the conventional senses, through some other channel for which there is no anatomical or neurological explanation. Scientific researchers who study such abilities call them extrasensory perception (ESP), but lay people often refer to them as the sixth sense. Either term really is a catch-all for a variety of different purported abilities that vary from person to person. Some people claim the power of telepathy – that is, the ability to perceive others’ thoughts, without having them communicated verbally or in writing. Others claim to have the power of clairvoyance, which is the ability to perceive events and objects that are hidden from view because of barriers or distance. Still others claim to be gifted with precognition, which enables them to look into the future and glimpse what hasn’t yet occurred. The belief in ESP or the sixth sense dates back thousands of years. The Greek historian Herodotus wrote that Croesus, who ruled a kingdom in what is now Turkey in the sixth century B.C., consulted oracles – that is, groups of priests claimed to be able to predict the future — before he went to war. In ancient India, Hindu holy men were believed to possess the power to see and hear at a distance, and to communicate through telepathy. In the late 1700s, the Viennese physician Franz Mesmer claimed that he could give people ESP powers by hypnotizing them. Just before his assassination in 1865, President Abraham Lincoln told friends that he’d dreamed of his own body lying in state in the White House. In the 20th century, Edgar Cayce and Jean Dixon attracted wide followings by claiming that they could foresee future events. During the Cold War, U.S. military and intelligence agencies, spurred by reports that the Soviets had psychics at their disposal, even tried to utilize clairvoyants who claimed remote-viewing powers for espionage purposes. As well as watching it directly from the Top Documentary Films website, it is also available from YouTube. Here are the four links. It is a most fascinating review of the scientific findings in this area. If you have a dog with you when you watch the videos, don’t be surprised if he or she fall asleep! Nothing new for dogs in all this!